I might get a few more rounds completed in my “25 Free Throws A Day” challenge, but it’s getting dark so early that it’s unlikely I’ll have too many more. So let’s take a look at how the stats shook out. I shot a total of 1625 free throws and made 1125 of them. (That doesn’t count the warm up free throws.) That comes out to 69%. My five and ten round averages generally increased. At the end, my five round average was 21 and my 10 round average was 20.5. My best was 22/25 and I hit that pretty early in the summer. I got it again a number of times but could never break through. I definitely choked a few times. For example, I once made it to 22/23 and proceeded to miss both of the next two shots because I was so excited about setting a new record. At the end, I finally got 23/25 a couple times. I feel like a perfect streak is within reach. I might keep going with this next year until I make that happen. If I can do that, I’ll be 0.48% of the way to the record of 5221 consecutive free throws made. This whole thing started as an excuse to get outside every evening so from that point of view it was a big success. I wanted to do a better job of enjoying our beautiful summer weather. It was fun to watch the improvement along the way. If I do continue this next year, I think I’ll change it up a bit and count the most consecutive free throws made. That makes it a lot easier to “warm up”. This year I struggled with the warm up period. Should I just shoot until I feel like I’m doing well and start counting? Or should I take 10 warmups every time? It was kind of squishy. 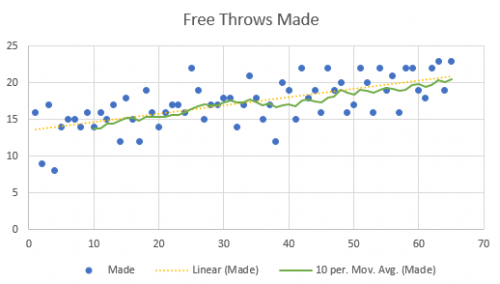 Counting the number of consecutive free throws made means that I don’t have to worry about a warm up period and I can shoot for as long as I want before stopping. I have plenty of time to mull that over while I wait for the sun to return next spring/summer.